View More In Bells & Sleigh Bells. Ring in the season with the 31st annual engraved Christmas bell from reed & Barton. 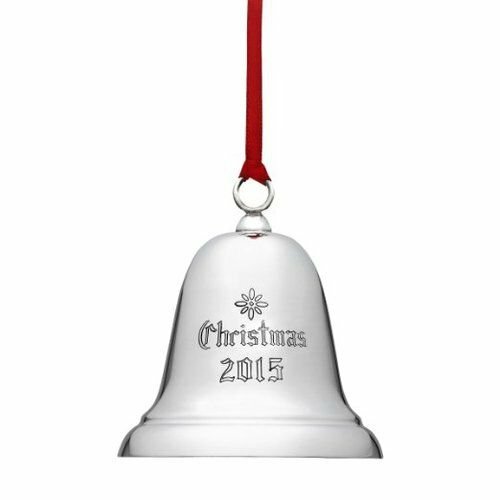 This collectible heirloom, in a traditional bell shape with "Christmas 2015" engraved on the front, is elegantly handcrafted in sterling silver by skilled silversmiths. Its jingle will ring for years to come in appreciation of the joy of Christmas. Personalize the bell and create a life-long holiday treasure. Part of the ringing in the season collection. Elegantly packaged for gift-giving and storage. Includes a red satin ribbon for hanging. Handcrafted in America. If you have any questions about this product by Reed & Barton, contact us by completing and submitting the form below. If you are looking for a specif part number, please include it with your message. Pack of 12 Artificial Snowy Christmas Branches with Green, Red and Orange Bells 34"
Pack of 12 Artificial Snowy Christmas Branches with Red Bells 36"
© 2019 - twoclock.com. All Rights Reserved.